Brrrr, looks so cold with that new banner! 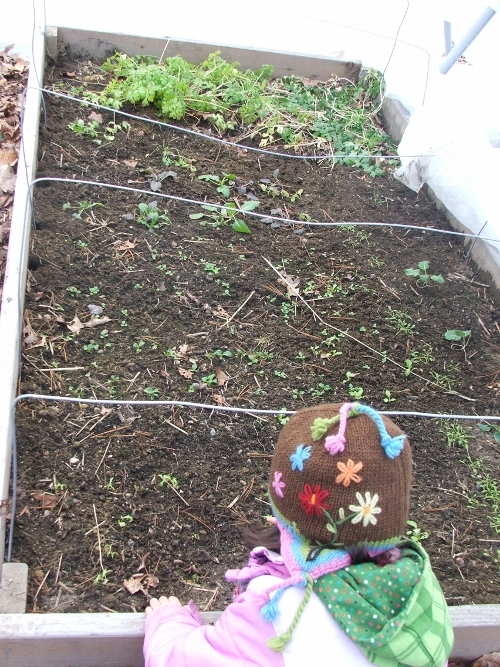 Inspired by Rob of One Straw, I went out into the cold, bright air yesterday – gloves, woolen cap – to move the compost. The idea was to transfer it from Earth Machine no.1 behind our house, which receives our daily kitchen scraps, to the Earth Machine no.2 in the hoop house. Right before our warm spell, when it was below freezing, I measured a balmy maximum of 64F in the hoop house. So, 64F inside while outside it was 30F! The observed inside minimum, however, was 20F – the outside minimum was 7. The low nighttime minimum is explained by the lack of a heat sink. The only mass is the beds, covered with white row covers. Earth Machine no.2 is black, but it was empty, so not much there to retain the daytime heat. 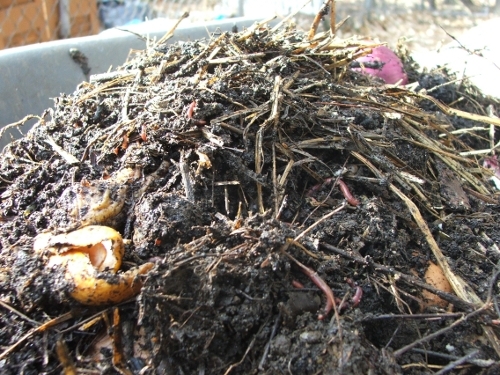 Now no.2 is full, almost to the brim, with food scraps from the past weeks, fresh straw (as insulator, aerator and carbon) and actual compost – complete with worms! What a surprise! I had expected some of the mass in no.1 to have barely started decomposing several months ago, and most of it not to have had a chance at all. And surely it had been too cold for worms. 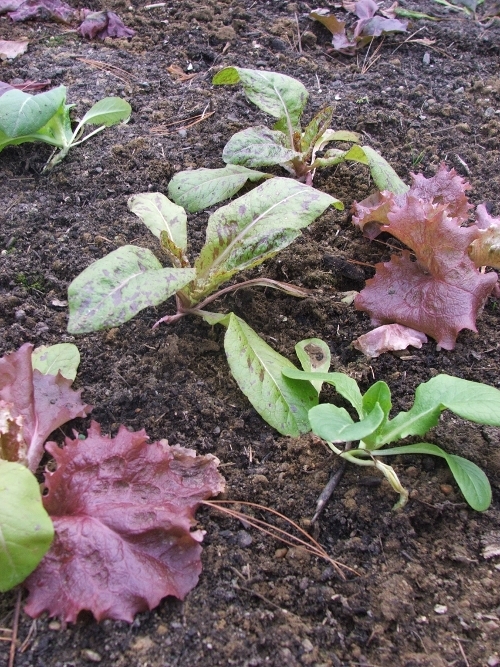 But no, the top half was teeming with the Red Wigglers that I had observed in my compost last Fall, before the cold set in. 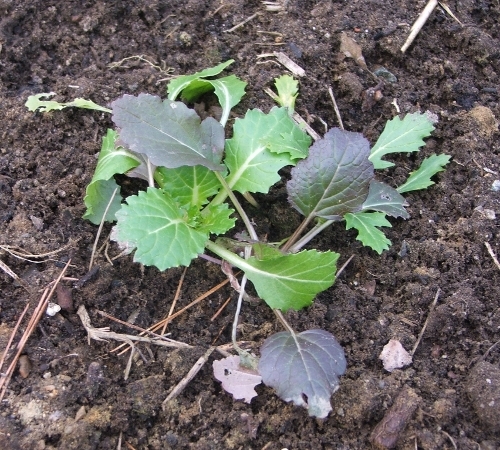 The quarter below that was almost finished compost. The bottom quarter had decomposed somewhat, but it had ice crystals in it, so I left that in no.1. All the rest I transferred to no.2 in the hoop house, where it will temper the indoor climate at night and where it might just get ready to go on the beds in early Spring. This is the scene outside. We’re supposed to get new snow today. I like the new banner — brrrr! 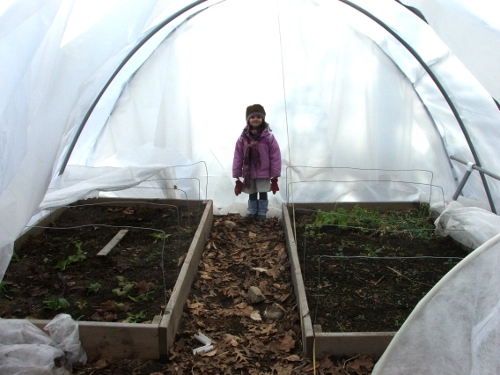 The hoop house looks wonderful — I take it things got put back together after your snow issues? 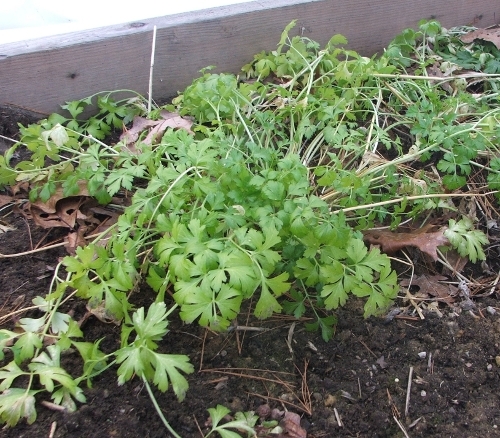 It must be so nice to see that green, fresh food in January! Hi esp, good to have you back! It’s not food yet, still needs to grow a bit. But the next time we have a spike in temps, I expect some edibles!